San Francisco (April 28, 2017) — The Rosenberg Foundation today announced the election of Kate Kendell, Executive Director of the National Center for Lesbian Rights, as new Chair of the Board of Directors. Mick Hellman, Founder and Managing Partner at HMI Capital and current Vice-Chair, will now also serve as Secretary of the Board. 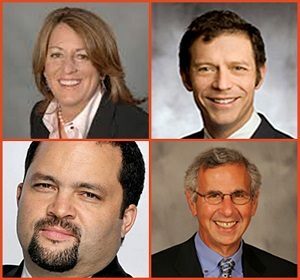 Benjamin Todd Jealous, a partner at the Kapor Center for Social Impact, will move into the role of Second Vice Chair, and Robert Friedman will remain Board Treasurer. Kate Kendell received her J.D. degree from the University of Utah College of Law in 1988 and has led the National Center for Lesbian Rights (NCLR) as executive director since 1996, shaping the organization’s broad and forward thinking vision around policy and project initiatives that seek to improve the lives of LGBT people and their families across the country. Marco (Mick) Hellman is the Founder and Managing Partner of HMI Capital. Prior to creating HMI Capital, he spent most of his career at Hellman & Friedman LLC, where he was a Managing Director and member of the Investment Committee. As a partner at the Kapor Center for Social Impact, Benjamin Todd Jealous invests in seed-stage startup companies that use technology to narrow gaps in society. An internationally renowned civil and human rights leader, Jealous works at the intersection of technology and social impact. Robert (Bob) Friedman founded CFED in 1979 and continues as CFED’s Chair of the Board and General Counsel. He contributes to numerous efforts to develop the asset-building movement, as well as advising on new strategies to bring excluded communities into the economic mainstream as entrepreneurs, savers, investors, and skilled employees. Learn more about the Rosenberg Foundation’s Board of Directors.